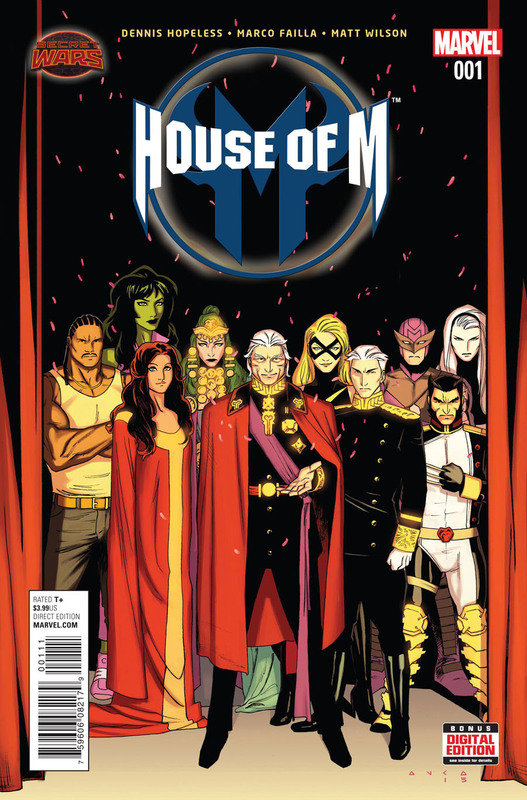 I’ve read the original House of M crossover event but I didn’t follow any of the revisits, until this issue. The Monarchy of M Domain. Castle Magnus. Magnus wakes up, from a flashback that brought on the events. 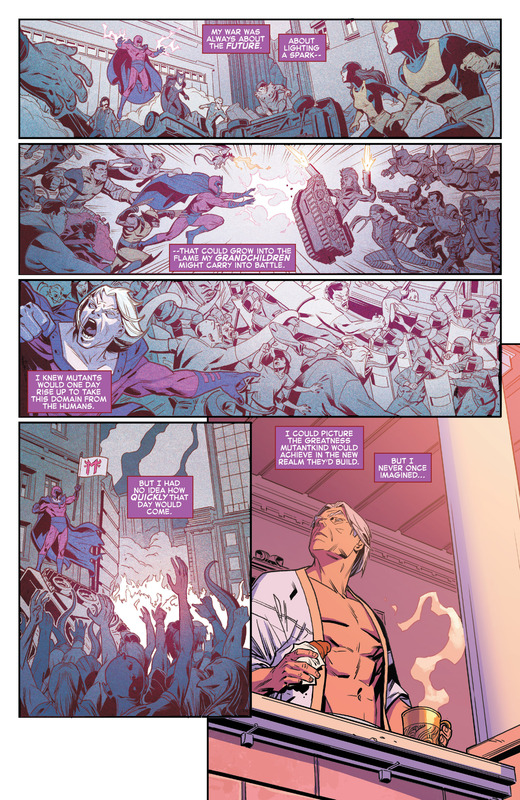 Magnus had to fight Sentinels and Namor, but now he reigns supreme. Well, under God Doom but still. We are treated to another page long flashback sequence. We see him with the original Brotherhood versus the Original X-Men. The second panel, is what got me to buy this issue. Lockheed, on the front lines, right there with Magneto! That’s pretty awesome! Them and the X-Men (minus Kitty Pryde, from what I can see) are fighting the Reavers. Finally, the uprising that got Magnus sitting on the throne. Now, he has the Sentinels working for him. Meanwhile, Genosha’s Human Quarter. Josie’s Bar. 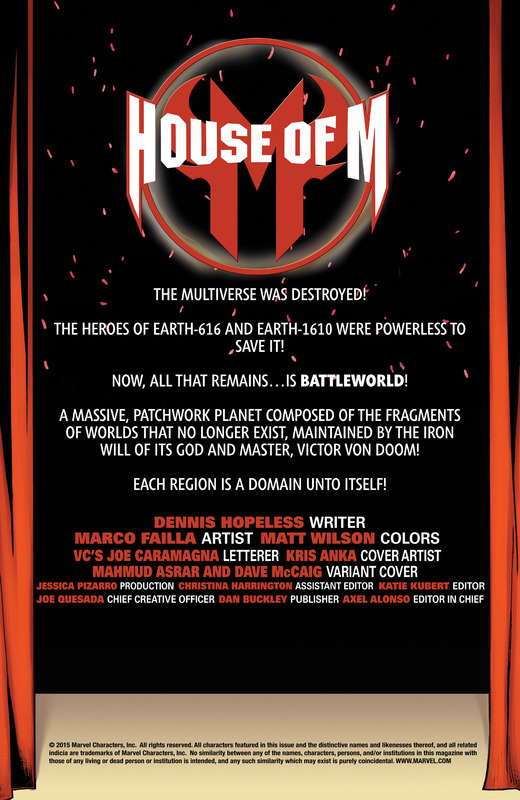 The humans include – Luke Cage, Hawkeye, Black Cat, Moon Knight, Elektra, Darkhawk (! ), Misty Knight, Iron Fist, Speedball and Bullseye are in attendance. There are three I can only guess at – Songbird, White Tiger and a guy with racing stripes down his arms – I’m not sure. Luke Cage wants to take the fight to Magneto and end this nonsense. Since this plan will go against Magneto’s goals, he has his elite team come in. Wolverine leads his SHIELD agents – Mystique, Nightcrawler, Rogue and Toad. Added to the team, in this realm, is Sasquatch and Marrow – who are not bad additions. SHIELD makes short work of the humans. Hawkeye gets the upper hand on Nightcrawler. Black Cat embarrassingly defeats Toad, in an awesome sequence. Wolverine chops off Misty Knight’s arm but don’t worry, it is her mechanical arm. I really like the choice of not showing Hawkeye defeating Kurt, they teleport outside and (with a page flip) Hawkeye comes barging through the wall in a car. Hawkeye shots a pair of arrows into Wolverine’s head and he runs away with Black Cat and Misty Knight. Meanwhile. Wanda and Polaris are eating breakfast. Quicksilver arrives, he’s suppose to be at the trade negotiations with Atlantis. Wanda is screaming at her children, to join her, at the table. Quicksilver is in Atlantis, as Magneto can’t stand Namor. Wiccan and Speed are not at the table, as they are performing a stunt, downtown. Wanda is so mad that she breaks through the wall, using that HoM brick effect, and flying off on some of those bricks. Quicksilver takes off too. Later. On the titantrons, in Times Square – Black Cat, Hawkeye and Misty Knight’s images are on the screens. They know they don’t have much of a chance, especially as a Sentinel arrives and tries blasting at these dudes. They run past a talking dumpster. In the dumpster is Deathlocket (son of Deathlok, it looks like) and he electrocutes the Sentinel. The issue ends with Lorna trying to warn her father that Quicksilver is up too something. Magneto doesn’t seem to care, he’s all for the worst case scenario – war with Atlantis. Under the sea, where the seaweed is always greener and it is better where it is wetter – Quicksilver and Namor are coming to an agreement. Next issue promises an invasion, so that should be fun.